Zucotti Park is beautiful in the holiday season. Delicate strings of white lights coat the trees where, just a few years ago, thousands of angry people stomped and plotted and harangued the world during the Occupy Wall Street encampment. Across the street to the east, the warm lights of the Brown Brothers Harriman offices filter out onto the morning sidewalk. And one block north, at Broadway and Liberty, the streets were ringing with chants this morning, early as hell. At a quarter to seven, as the dark was still giving way to daylight, hundreds of protesters had colonized the eastern half of Broadway on behalf of the Fight for $15. The (shockingly successful!) movement for low-wage workers holds these national “days of action” every so often, gathering fast food workers and cab drivers and airport workers and whoever else is feeling peppy in cities across the country to stage simultaneous protests. It’s a fairly effective way to keep an issue like “low wages”—a long-term state of affairs not given to highly visible happenings—in the news. Almost certainly not! There is no way around the fact that this is an absolutely terrifying time for anyone fighting against inequality, or on behalf of the poor. The tentative gains the movement has made over the past four years are likely to grind to a halt, and union power is likely to be threatened legally and politically. A new report from the National Employment Law Project estimates that the Fight for $15 has won workers $62 billion in raises since 2012; whether that well has run dry will depend less now on garnering broad public sympathy and more on how much raw people power the labor movement can flex. When the Republicans finish arraying the Supreme Court and the NLRB and Congress and every federal agency against unions, unions will have nowhere to turn except to their own members. And the streets. 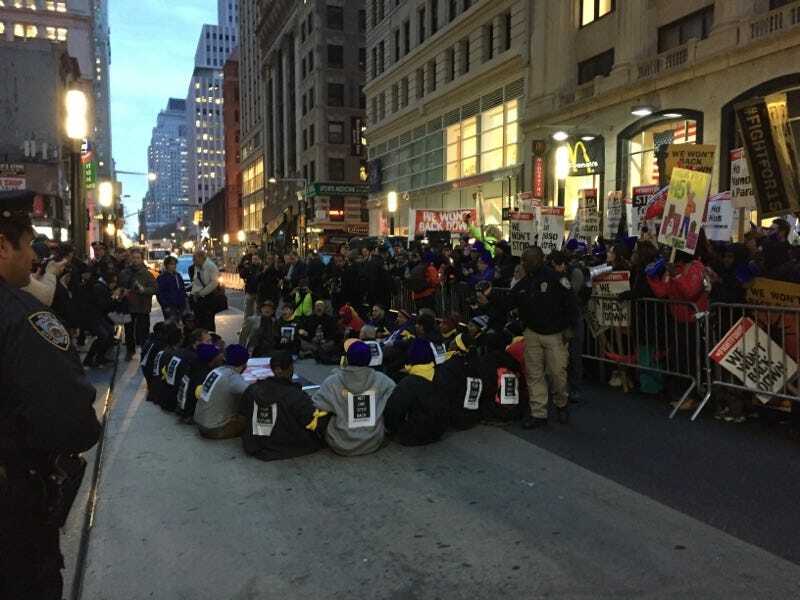 Shortly after 7 a.m., a group of workers and activists sat down and linked arms in the middle of Broadway, and the police dutifully arrested them. They were escorted away one by one, smiling, past a cheering crowd of supporters, like basketball players after a winning game. The dozens of NYPD officers on the scene—union members themselves—looked bored. (The press, not the protesters or cops, is the most unruly element at these events.) After the group of martyrs were securely in the paddy wagon, the rest of the crowd marched off to further protests elsewhere. The police opened the road again, and the first cars to drive by were cabs festooned with “Yellow-Green Uber Drivers Unite!” signs. An admirable piece of traffic activism coordination. As today goes on, fast food workers and Uber drivers will protest in hundreds of cities; airport workers in Boston and Chicago will strike; hundreds of protesters will get themselves arrested, and dozens of politicians will give supportive speeches. At Broadway and Liberty, everything was cleared out in time for rush hour. Eighty blocks up the street, atop Trump Tower, the threat loomed.